The BLE112 is a Bluetooth Low Energy (BLE) radio. Please consider a breakout board for it. Please make this breakout board!! LyCannon wrote: Please make this breakout board!! I just got this up on InMojo. Most of my efforts have been with the WT12 module, but I branched out into the BLE112 as well to see how that might fit with some of my projects. The linked page also has Eagle .sch/.brd files available for download. @pcrom - can you advise on the tecniques you use for soldering directly to the module? I'm new to electronic engineering (coming from a computing background), I have my modules, and want to program them up and wire direct to 3.3v cell battery. Well I just glued the module on its backside and soldered wires directly on the pads. Small wires are most convenient. We did look into this as an option for a breakout board. Unfortunately, we did run into some supply issues, so we are currently looking into different options for this. We are working on it however! Hi , i have seen some of you, are looking for a breakout board, check this out . 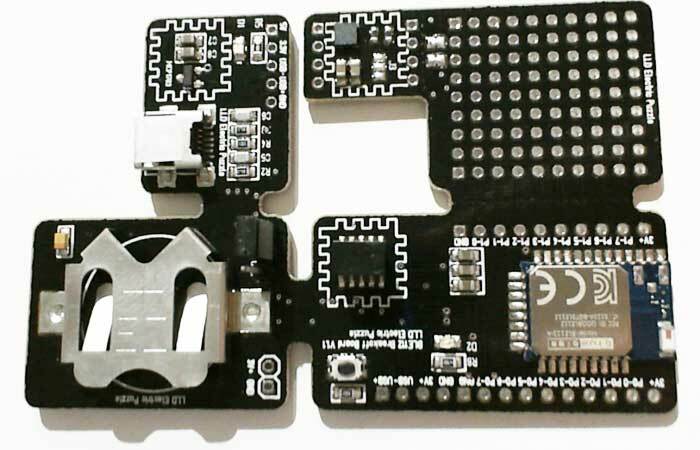 It has the BLE112, a LIS3DSH 3-axial digital accelerometer, USB, LED's, ccDebugger Pins, proto area and a coin cell holder. And the overall design was inspired by you guys at sparkfun, due to you snap of boards. This board can be also snapped apart. Maybe sparkfun likes to add those to there store ? Thanks for posting those links everyone! I've passed along the info to our product vetter to check out. We have some 4.0 stuff on the way. The BLE112 is not one of the items, as we felt it lacked functionality that would be necessary for most projects. The first parts should be hitting the storefront before the end of the year. Any news on any new BLE 4.0 modules yet? I'm itching to continue my project and like you found that the BLE112 lacked the functionality, specially with their embedded uP that requires TI's $2K workbench to properly program it. I would really like to see what's your solution to the big void of BLE and 4.0 modules so much needed. We have a board in the works currently but ran into a production issue with it. Hopefully it will be live on the site in the next couple of weeks. What BTLE radios is Sparkfun looking at selling breakouts for? Since most of the BTLE modules depend on expensive 8051 compilers to function (because of Chipcon), the BLE112/BLE113 have a clear competitive advantage for hobbyists and smaller companies.